Click the image to see the full map. HERMON, Maine — The runaway Montreal, Maine and Atlantic Railway train that plowed through a small Quebec town killing 50 people on July 6 had one engineer assigned to it. The American union of railway workers representing most of Montreal, Maine and Atlantic Railway workers thinks the practice is dangerous, and has fought that work condition unsuccessfully since it began several years ago, its representatives say. 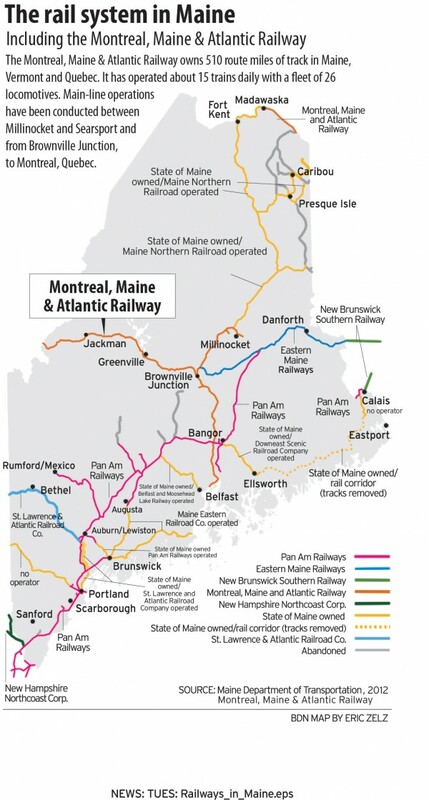 A mediator has been assigned to help Montreal, Maine and Atlantic Railway and the union settle its contract negotiations, said Cole Davis, vice president of BLET. 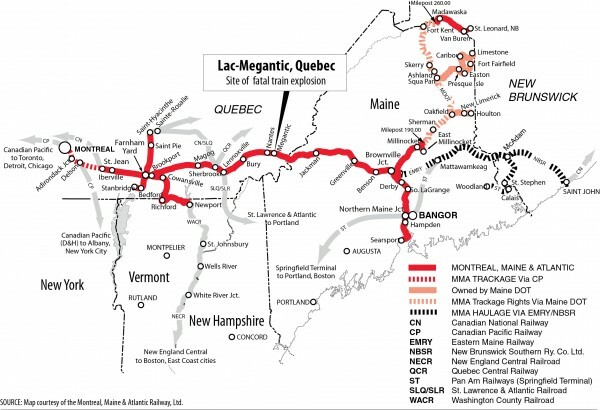 Montreal, Maine and Atlantic Railway has a long history of accidents in Canada, according to the Canadian Transportation Safety Board, which shows 129 accidents, including 77 derailments — some of them minor — since 2003. It is one of only two rail companies in Canada, both of them small, that is allowed to operate trains manned by a single engineer, Canadian authorities told Reuters. On the American side of the border, when Montreal, Maine and Atlantic Railway formed in 2003, the company’s formation eliminated the union contract held by the century-old Bangor and Aroostook Railroad when that company was purchased by rail conglomerate Rail World Inc. and renamed, Twombly said. That contract mandated two-man crews. The new freight service, which had about 275 workers, cut employee wages by 40 percent because of the bankruptcy and shutdown of the old Great Northern Paper Inc. mills in East Millinocket and Millinocket, a major rail customer. In 2005, the company held a demonstration of the remote-control system by which one engineer could control an automated locomotive for the coupling and decoupling of cars. By 2010, the system was being installed company-wide. Union workers believe the system is unsafe because it leaves trains often carrying volatile materials in the hands of one person who could suffer a medical problem or encounter other issues that could cause problems, Twombly said. Known as “The Boundary,” the area between Jackman and Lac-Megantic is a stretch of about 30 miles that lacks roadway access, an especially hazardous place to send a one-man train, Twombly said. Sandra Dearden, a railroad industry consultant and founder of Highroad Consulting in Indiana, questioned whether the use of remote-controlled trains was by itself hazardous. Railways designated Class 1, which are among the nation’s largest, employ two-man crews, but shortline railways such as Montreal, Maine and Atlantic Railway more commonly employ one-man crews and remotes, Dearden said. Montreal, Maine and Atlantic Railway CEO Edward Burkhardt is very safety-conscious, Dearden said, adding that it was likely that Federal Railroad Administration inspectors would have prohibited unsafe practices given the frequency of their inspections of railways. FRA inspectors are due to begin a review of Montreal, Maine and Atlantic Railway practices, tracks and equipment on Thursday. The Maine Department of Transportation has already begun a similar review, officials have said. Burkhardt did not return messages seeking comment on Tuesday and Wednesday.